Interesting story with a great narrator. I received a free review copy of this audiobook at my request and I have voluntarily left this review. This was a new unique idea about angels and demons. The story was interesting and once it pulled me in it was difficult to put it down. The story is not founded on Christianity beliefs. It’s a new world with a totally new take to angels and demons. This new world is very different than ours and there is quite a bit of world development and the story moves along well. The main character is quite young but she seems very caring and humble. I was not ready for the story to conclude so soon! I’ll be looking forward to the next installment of this new fantasy series. An interesting and unusual audiobook that has a really unique take on angels and demons. With winged and wingless angles, hybrids, demons and an uncaring Celestia, this story will enthral. Azrael is a great character and you cannot help but like and feel for her as she suffers. She is not perfect but she works to overcome her flaws. This story illustrates well that good and bad co-exist and it often takes seeing and understanding the bad in order to be able to know what good needs to be done. The narrator had an angelic type voice that fit the story well but I did find her intonation a little flat and it took some of the tension and excitement from the action scenes. Overall it is a unique story and I will look forward to the next instalment. A.J. Flowers has written a very interesting and fast paved novel with a different storyline than the average angel and demon book. Enough so that listened to it twice. She is also talented enough to be able to do her own narration. Fallen to Grace is the first book in my new favorite series! I was really looking forward to listening to this book; unfortunately, I had a hard time getting into this book and never really connected with the characters. I wish there had been a little more world and character building. The narrator did a great job. I received a review copy at my request and voluntarily reviewed. It is a book that evolves slowly and follows the transformation of Azrael from a good/evil hybrid to an angel queen. 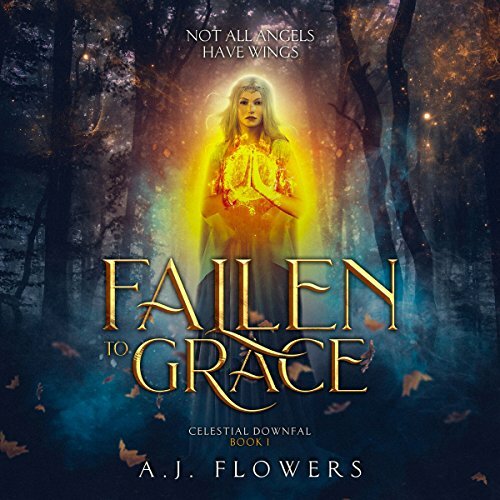 A very different take on those tales of good against evil, "Fallen to Grace" transports us into an unusual world where not all angels are perfect and not all devils are cruel. Azrael is the balance between these two contrasting worlds and we follow her metamorphosis into a beautiful angel with powerful wings that comes with much suffering and heartaches. She becomes the queen, ready or not, and she will need to prove that even with her imperfections and demonic deals, she is worthy and capable of the title. Gabriel is her strength and weakness. She looks up to him for guidance, but is also able to carve her own destiny even without his assistance. Well narrated and interpreted, you will enjoy this different tale of angels and demons in a world so alien you won't have any reference point. The author, as always, is outstanding in his writing style. This had great narration and the story is a different take on how the world views angels and demons. This was a story that was worth listening to. I think that this take brings a new dimension to the subject and makes the book stand out. I got this story via audiobook boom and this is my voluntary review. I liked the idea but the execution was a little weak. I found myself confused and drifting off a lot. The narrator was good, but there were a couple errors where she repeated a line twice. Overall, if you like angles give fallen to grace a try. It has a new and interesting take on the genre. I found the idea behind this story really interesting but hte execution left me confused at times. At the end of the book I was left wondering how all the pieces go together and what it's all supposed to mean. Perhaps that was intended by the author but I found it a bit frustrating that so much was left unresolved. Of course there are other books in the series that will probably explain everything but I'm not feeling drawn to get the next book. It's a shame because the writing is vivid and clear and flowed nicely. Perhaps I missed something, or failed to connect some dots, not sure. I don't regret listening to it, I'm just not looking for more. I'm not a fan of the narration, I found it mono-tone and lacking in emotion, it detracted from the story. Although the character voices were fine. This was such an interesting and unique read that hooked me! This captivated and dominated my attention that I just wanted to forget my responsibilities and just listen for six hours straight...which I did! And I am so glad I did! So incredibly unique and beautiful! The narration was perfection! I fell into the story with ease since the narrator was brilliant!